My friend Steph was once my houseguest for two weeks and in that time she requested this salad three times. After I’d already made it for her twice, in an attempt to plow through an abundance of kale I’d had on hand. That’s five times, in two weeks. 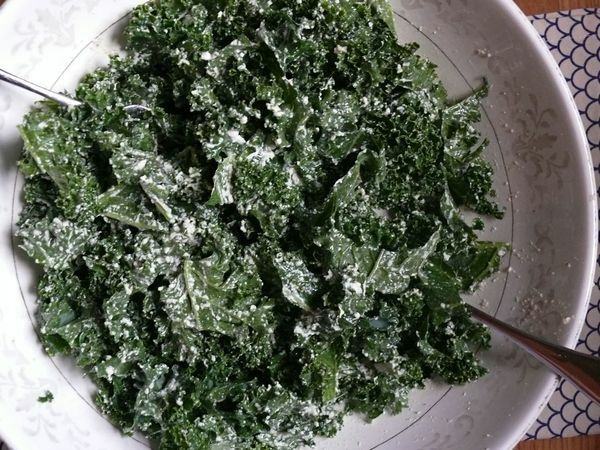 I like kale but am not as into it as she is–kale people crave it with the craze of addicts–but I can still honestly say that I didn’t tire of this salad. For me, beyond kale, it’s got a lot of other hooks. It has a very creamy, salty dressing that gets its claws into you too. It was inspired by a kale salad I had at Five Leaves in Brooklyn, which was essentially a spicy kale Caesar salad with hazelnuts. In my version, olives and feta combine to make a convincing faux-Caesar dressing. The spice and nuts in their salad reminded me instantly of the nutty paprika oil I make to top cheese toasts and other creamy things. The salad can exist without it but I highly recommend making the tiny extra effort. I also suggest you stock up on kale before you make this the first time. You may need a quick, subsequent fix. Add the garlic to the oil and let marinate for 10 minutes, then scoop out and discard the garlic. Meanwhile, stack the kale leaves in manageable piles and slice crosswise into long, thin strips. Process the oil, cheese, olives and pepper in a food processor or blender until creamy. 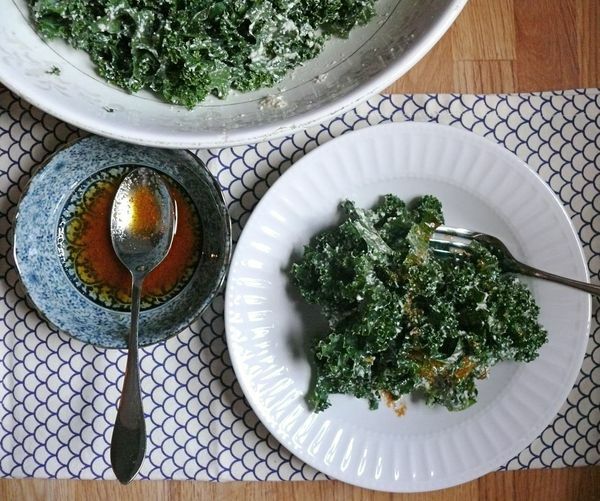 Pour dressing over kale leaves and toss with your hands until the leaves are well coated. Transfer to a serving bowl and pass paprika oil around at the table, or serve the salad onto individual plates and drizzle with a sparse amount of paprika oil (if using). Whisk all of the ingredients together until well combined. 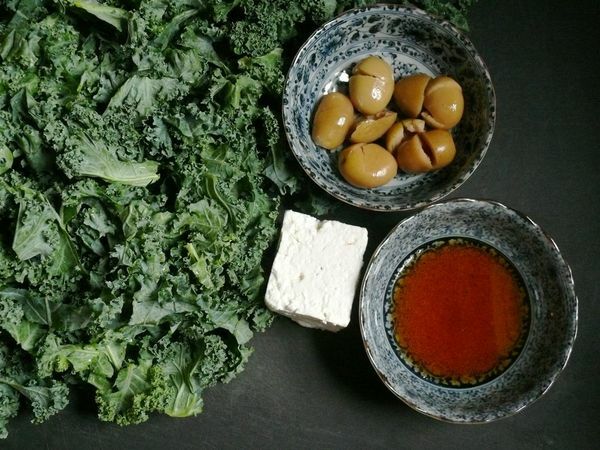 Serve alongside or drizzled onto creamy kale salad. this is my new favourite salad. as a matter of fact, i’m going to make it right now. yum! !